Life on the Farm in Sunny Valley was just great until the evil professor Duriarti escaped from prison! The heartless bad guy's first act was to seize the farm and take all of its inhabitants hostage to conduct hideous experiments on them. 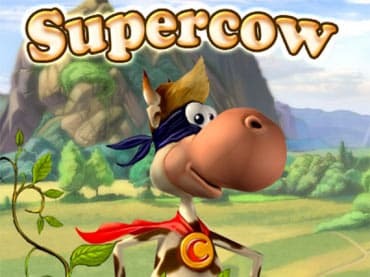 Supercow is good entertainment for virtually all age-groups. It has a lush game world with a healthy dollop of good humor! Free Game features: - Fascinating plot that's a sure blockbuster; - 50 levels of an exciting game-play balanced to the last detail; - A unique virtual world; - Every character is animated in 3D, has his/her own personality and unique sense of humor; - Intuitive and well-thought gameplay; - Overflowing with humor; - Supercow is a game that's great for the whole family. If you have questions about Supercow game, please contact us using this form.